We are only six days away from watching our Ducks run on the field in Pasadena, CA to face the Florida State Seminoles in the Rose Bowl. All of the players got to go home to spend some time with their families last week and then departed to California on December 25. Although I am sure that this upcoming semi-final playoff game was on their minds 24/7 while they were away from the field, they’re back on the field and working as hard, if not harder, as they always do leading up to a game. The Florida State Seminoles are definitely a force to be reckoned with as they have led back-to-back undefeated seasons this year and last year. They are ranked No. 3 and our Ducks are No. 2, but rankings don’t really mean anything anymore once everyone steps on the field; it’s each team for itself. There are certain players on this Seminoles squad that are rough and tough and play their game quite differently than we have seen our Ducks play before. Jalen Ramsey is a top-pick of the Rose Bowl for our Ducks to watch out for. Not only is Ramsey strong and aggressive physically, but he is strong and aggressive verbally. According to an article on OrlandoSentinel.com, this 6’1″ sophomore defensive back plans on bringing “controlled chaos” to the Rose Bowl. Writer Brendan Sonnone explains that Ramsey figured out a long time ago that football is a mental chess match and if his athleticism wasn’t going to fluster his opponents, his mouth definitely would. 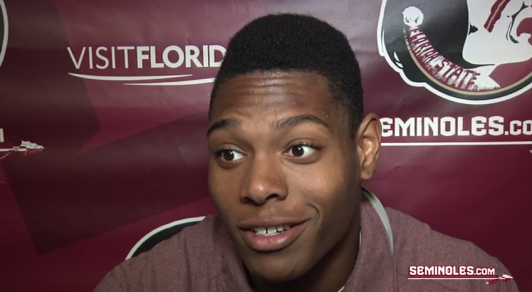 FSU defensive end Jalen Ramsey. Personally, I am not a fan of players that talk a lot of trash on the field. I am sure that trash talk is something we as fans don’t really know about because we don’t hear it, and half the time we don’t even see it happening; however, in my opinion it is obnoxious. I would much rather have our quarterback “trash-talking” by telling the opponent they’re doing a good job to get in their heads than for there to be “controlled chaos” going on with any of our players. I suppose we will see how this kind of trash talk affects our Ducks when the clock starts running on January 1 in Pasadena, CA. My guess is, our Ducks are going to be just fine.